Trip report of a two week trip around the Sabah province on Borneo in Malaysia from April 2nd – 14th 2011. I took an organized round trip to Sabah on the island of Borneo, located off the coast of mainland South East Asia. The tour operator is specialized in nature tours in small groups and we were just 6 participants with two tour guides for this two week trip to the province of Sabah, a Malaysian state. Borneo is actually the third largest island in the world and is comprised of three different counts: Indonesia (called Kalimantan, about 53%), Malaysia (called Borneo, about 26%) and the Sultanate sovereign state of Brunei on the northern coast which occupies about 1% of the island. Considered to have one of the oldest rainforests in the world, Borneo has frequently been in the top of environmental concerns which are even more complicated by the existence of three separate nations each with their own policies in regards to the future of the rainforests. We disembarked at 10:00am at the international airport of Kota Kinabalu after a long flight from Europe. We got our luggage and were taken to the hotel in Kota Kinabalu, the Hyatt Regency. The program for the day is already over, we are all tired from the long flight and welcomed the rest in which we can acclimate to the very humid hot sunny weather on Borneo. I relaxed just for a few hours in the room before going to the pool for a while. At 32 °C (90F) there is not much I could do anyway as I was not used to this climate coming from nearly wintery Europe in comparison. In early evening, I went to the waterfront of Kota Kinabalu which is just in front of the hotel. A lot of people, tourists as well as locals were there to admire the sunset over the sea. I met the tour guide and we enjoyed dinner at a food stall on the waterfront, taking tasty fried noodles with fish. We did, however, not stay too long and headed back to the hotel; it was a long and tiring flight. 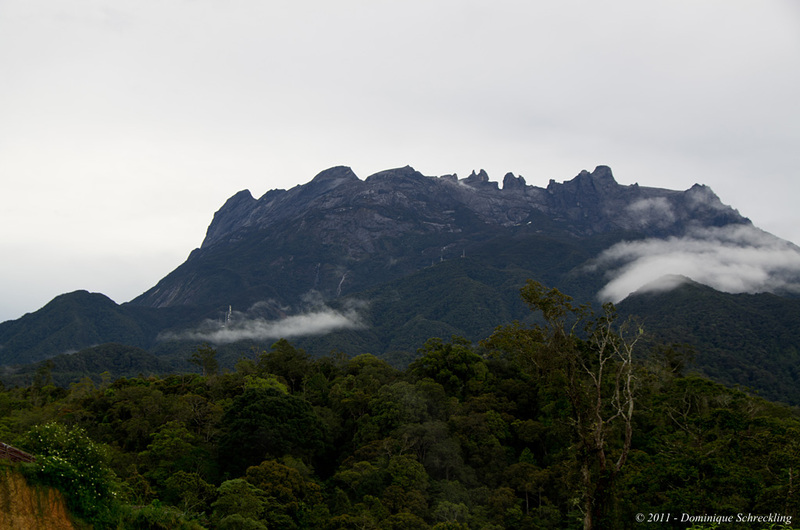 We left the hotel at 9:00am and took the direction of the Kinabalu National Park. On the way to the Kinabalu National Park, the Mount Kinabalu made an appearance out of the clouds. We stopped immediately to take a few photos; one never knows when Mount Kinabalu will show itself again. A few minutes later, the mountain already disappeared back into the clouds. We made another stop in a village for a longer break. The market was unfortunately closed as it was Sunday. There were only a few sellers with only a few bananas or pineapples. We reached the Mountain Lodge at the edge of the Kinabalu National Park just before lunch. It is a simple hotel but the rooms did have a superb view on Mount Kinabalu. We appreciated the fresher mountain air on 1500m (5000ft) above sea level. After lunch, we took our first trip to the National Park; a walk in the forest to get an overview about what is growing there. The trails are easy and very well build. We are shown, among other things, the smallest orchid in the world. In the green woods, there are a few trees which caught our attention with an almost orange glowing trunk. These trees belong to the family of Eucalyptus and are endemic for Borneo. After the walk, we headed for the botanical garden. Besides a few flowering orchids, there are some quite large Nepenthes (tropical pitcher plants). We also kept a lookout for birds. There are quite a lot there, but the observation is really tough. It is almost impossible to describe where a bird is sitting in this dense forest and there is always branches or leaves in between preventing a clear view. Usually, one understands the location the guide tries to explain just at the moment the bird flies away. 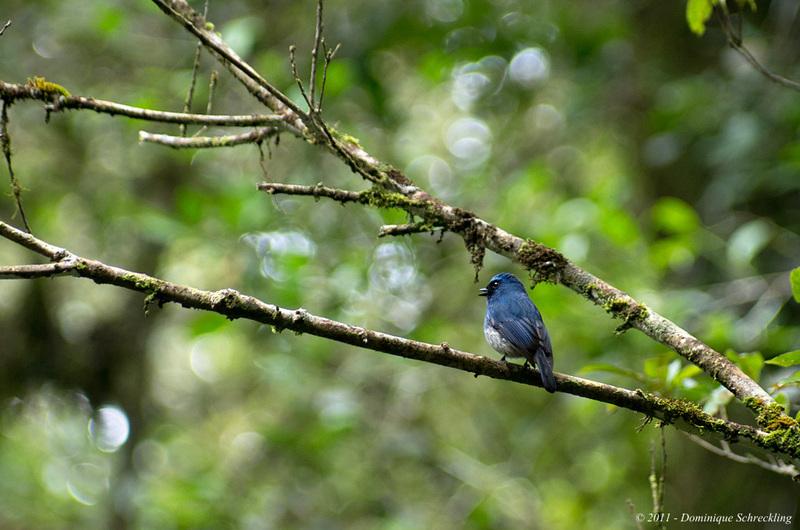 A very welcome exception for the afternoon was an Indigo Flycatcher sitting surprisingly free and showing its beautiful colors. After the botanical garden, we went to a power plant. This is one of the starting points for the climbers of Mount Kinabalu. We took a walk along the road in the forest but a dense fog was coming in so we finally returned to the lodge by 5:00pm. In the evening the fog lifted for a little while giving a great view on Mount Kinabalu during sunset. The night was cool and comfortable thanks to the altitude. We left the lodge at 8:00am and drove to Poring Hot Springs at 500m (1600ft) altitude. The sky is mostly covered, but back at these lower altitudes, it is again very hot and humid. We began the visit with the canopy walk. A Pigmy Squirrel could be seen on a tree. For the canopy walk, I needed to pay an additional fee of RMY 5 (USD 2) per camera to be allowed to take photos from the bridges. The hanging bridges between the trees are fairly different than those in Costa Rica. Here the bridges are very narrow and so unstable that observing or photographing is not possible. 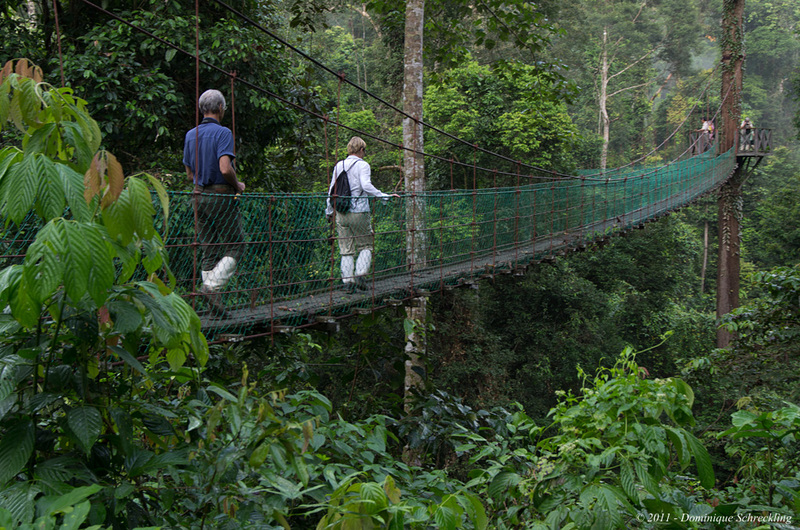 In addition, there are so many visitors you cannot even stand still for a little while to appreciate what a canopy walk is initially meant for: to give the visitor a chance to observe the rainforest from above. There is little enthusiasm in the group on this canopy walk. Given the conditions, we could also have saved the camera fee. Then we went for a hike to a waterfall. On the way we discovered a crab spider. In this dense forest one is well protected from the sun, but then, the dense forest also protects one from the wind; one gets very hot and sweaty. The forest is loud. Besides the cicadas one can hear a lot of birds, but these are again extremely hard to see. Except for a Black Headed Bulbul, most of the other birds were out of reach of the camera or constantly hidden by branches. After lunch we left the Poring Hot Springs and headed back towards Mount Kinabalu. We made a detour via the Mesilau Nature Reserve at 1900m (6200ft) above sea level. The air was again very pleasant. There is, however, a fairly strong wind which makes bird watching even more difficult. 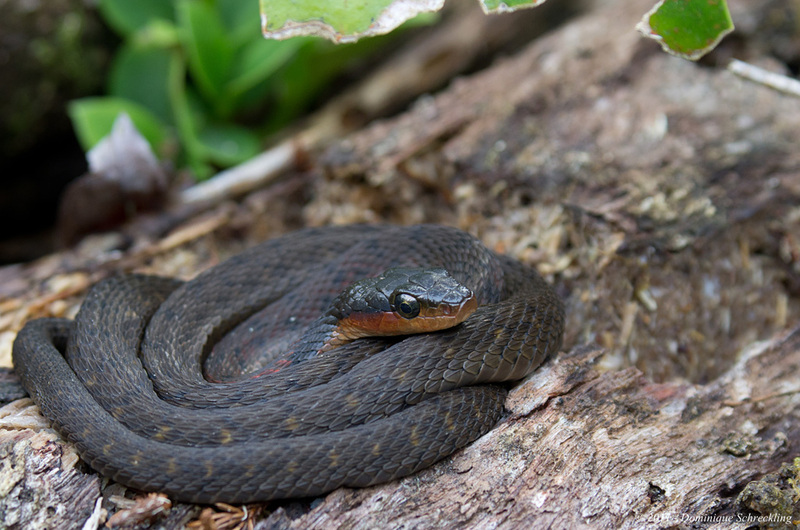 We discovered a little snake curled on a rock, a Red Headed Keel Back Snake according to our guide, a venomous snake. Finally we took the way back to our lodge, just in time. At the moment we reached the rooms, it began to rain, a real tropical downpour. It rained almost the entire night. We left the lodge at 8:30 in the morning and went again to the power plant within the national park. Since the trails are way too wet after this rainy night, we just walked along the road from the power plant to the entrance of the National Park and looked out for birds and flowers. Unfortunately, like the previous days, while there are a lot of birds to be heard, few do get within range of the camera. In addition of the birds, there were quite a few beautiful yellow orchids growing wild just next to the road, as well as wild ginger. During the walk we had a light drizzle. We all marveled at the many different ferns and lichens. Shortly after noon we were back at the lodge for lunch and the rain finally took a break as well. After the lunch break we went back into the National Park and took a hike after the visit of the very nice Park’s Natural History Museum. Thankfully there were quite a few birds which could not only be seen, but who showed themselves well within reach. One such bird was a Chestnut-headed babbler. However, the dry period since lunch did not hold out very long and the heavy rain was back at 4pm sp we canceedl the hike and drove back to the lodge. It rained almost the whole night again. In the morning it was overcast, but at least dry. Mount Kinabalu showed itself for a few moments without clouds. 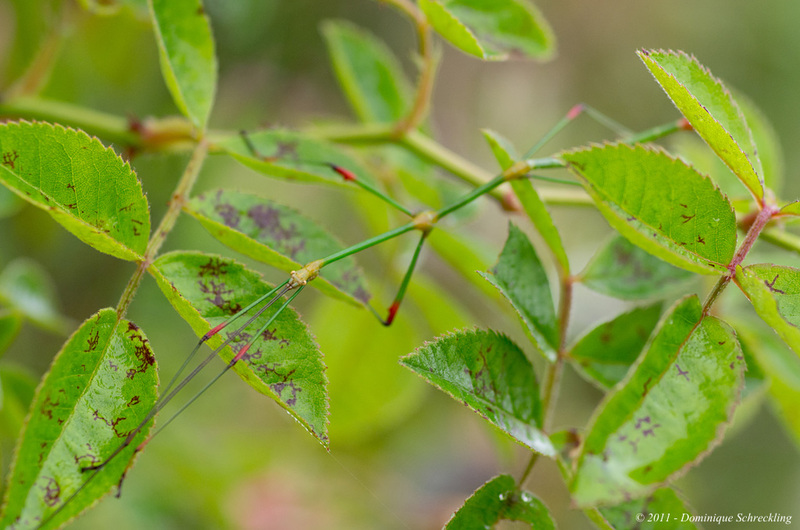 In the plants around the lodge are quite a few stick insects to be seen, at least for the trained eyes of the local tour guide. We packed our bags and left the lodge. We took the road back and firstly went to a market. Most people do unfortunately not want to be photographed, at least not by men. The women in the group however, could freely take photos. There are not a lot of different fruits to be seen in this season. Apart from the usual bananas and pineapples are a few papayas. There were, however, a lot of vegetables as well as a large selection of dried fish. The tour continued to Kota Kinabalu. The tour guide took us to a bird sanctuary nearly within the city. The area is a mangrove swamp. There are some birds to be heard but seldom can they be seen. There is a colony of Purple Herons as well as one Mangrove Heron fishing just in front of one of the hides and quite a few very colorful doves. The employees of the bird sanctuary tried to release a pretty large mud crab from a fisher net. After this visit, it was time to go to the hotel, again the Hyatt Regency. We hardly arrived at the hotel when it started to rain again. The hotel is providing umbrellas if we wanted to go out despite the weather. I went again to one of the food stalls along the sea to have dinner. The first days of the trip to the Kinabalu National Park had been interesting. The altitude provided lower temperatures which helped us for the transition from still winter-like conditions in Europe compared to the tropical heat on Borneo. The walks in these tropical forests in the Kinabalu National Park were a most unique experience, a fairly dense forest with a vast variety of plants as well as birds and insects that were extremely loud. On the downside was the weather. While it should have been the dry season, it rained almost every day. The other negative aspect was the high safe distance kept by the birds. Why do birds, even in National Parks or bird sanctuaries, keep such an extreme distance compared to similar regions and conditions like Costa Rica? The day started very early. We left the hotel at 5:30 in the morning for the airport. It was cloudy, but at least it was not raining. We took the 7am flight to Sandakan. Before takeoff, the pilot announced the weather for Sandaken: rain… During the flight, the clouds blocked the view on Mount Kinabalu. As we approached Sandakan in the rain, what looked like rain forest during the flight at higher altitude turns out to be a single, huge area of palm oil plantation. The flight to Sandakan took just 40 minutes. From the airport, it took a one hour to drive along with palm oil plantations on both sides of the road to the jetty where we took the boat out to Libaran Island. The boat ride trip us through narrow flow paths between palms and mangroves before reaching the sea. There was hardly a dry spot in the boat with all the rain coming down. As we reached Libaran Island, the rain came to an end as well, I was dripping wet. It took quite some time until everyone had an acceptable room in this Libaran Island Lodge which had its best years probably many years before. My first room had no water at all and it took them one hour to find out that they will not be able to fix it. They spent another two hours cleaning another room for me. We took a longer afternoon break after lunch. There are quite a few birds around; doves, sandpipers and even an eagle. But the safety distance kept by the birds was extremely high here as well. The sky cleared up during the afternoon and finally blue sky came out. At 4pm, we were served coffee and fried noodles. At 5:00 pm we took the boat again. This time is was for the main purpose of the trip to this region: an evening on Selingan Island in the sea turtle sanctuary. The boat ride took 30 minutes. Selingan is a beautiful little tropical island like all of us had imagined; beautiful sandy beaches and palm trees. The visible distant islands that could be seen from here belong to the Philippines. We first watched the beautiful sunset before heading for the visitors’ center of the island. From 6:00 pm onwards no one is allowed on the beach anymore. We took seats around the visitors’ center where we had our dinner without any light except moonlight. Artificial light is not permitted as it might confuse the turtles. The tour guide explains to us what is coming next: we wait until the rangers come and get us once a turtle is sighted on the beach. Those wanting to take photos are required to pay a camera fee which will be used for protection programs for turtles. A long wait began. The sky filled with stars, the first stars we had seen since our arrival on Borneo a few days earlier. At 9:00 pm a ranger came and informed us that a turtle was laying eggs on the beach. Each night, four rangers monitor the beaches of the island and report each turtle coming ashore. They wait until the turtle has dug a nest in the sand and laid at least 30 eggs before bringing tourists to the turtle. 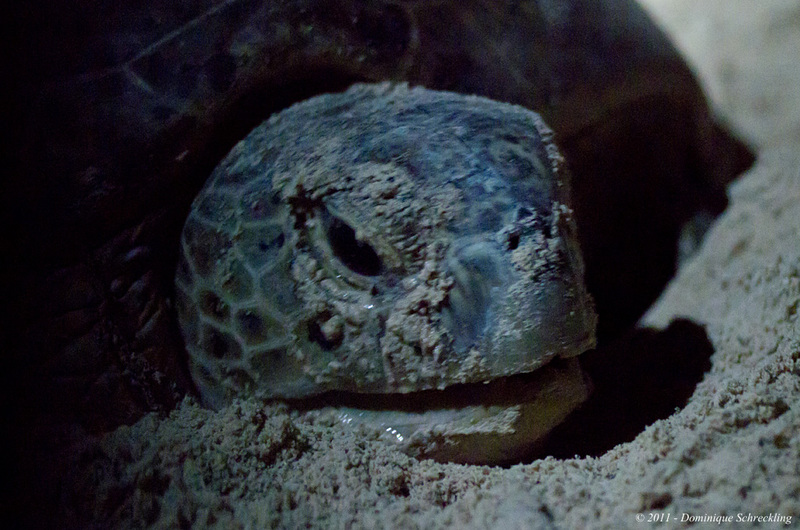 This night, we are shown a pretty large green turtle laying a total of 106 eggs into the sand. An assistant took the eggs and put them into a bucket. Once the turtle was done, we were requested to calmly follow the ranger taking the eggs to the hatchery. We then head back to the beach following the ranger with a bucket of freshly born turtles. They are released one meter (3ft) away from the sea. The contact and recognition of the beach is important in order for them to find their way back to this beach when it will be their turn to lay eggs. Around 1% of these turtles will survive and visit this very beach in 15-30 years. After this unique experience, we take the boat and go back to Libaran Island for the night. After the sea turtle on the previous day, another highlight of this trip awaited us: orang utans. We left Libaran Island at 7:30 am and took the boat back to the mainland where the bus awaited us. Then we went to the Sepilok Orang Utan Rehabilitation Center. We reached the Sepilok Rehabilitation Center at 9:00 am where we first got a presentation about the objective of the center. The main purpose is to rehabilitate orang utans which have been kept as pets or the young orang utan orphans which need to be taught what they need to know in order to survive in the wild. The cost for rehabilitation per orang utan is over £1500 and can take up to 10 years. The money is needed for medicine, food as well as toys for the youngest. Another goal is to educate the human population, both locals and visitors, in order to make them more sensitive about these animals whose natural habitat might disappear completely within the next 10 years if no additional measures are taken. A particular threat is regarding the oil palm industry. After the presentation and the film, we were given some rules to follow when entering the center. Bags were not allowed inside the center because they arouse the curiosity of the orang utans. The photographers are requested to pay attention to the equipment and keep some distance from the animals in order to avoid having to try to exchange a camera for food from the orang utans. At 10:00 am we entered the center on broad walkways to platforms from where one could observe some of the 60-80 orang utans living in this center. This part reminded me a bit too much of a zoo visit where a lot of people are watching a few animals. I tried to find a better place to take photos and a bit further I saw a pretty young photogenic orang utan in the trees and shrubs. We left the center and continued the drive towards Sukau. This part took almost 2 hours and during the entire drive, all one could see is the palm oil plantations on both sides of the road. We took a short stop to have a better look at the plantations. Apart from the oil palm trees there is almost nothing else growing here. What a contrast to the noisy forest on Mount Kinabalu. At the platations, there were almost no sounds at all; not even a single bird calling! The weather turned strange. We experienced quite a lot of brief but heavy rains followed within a few minutes by bright sunshine. We reached the Sukau River Lodge by 1:00 pm in bright sunshine and it was very hot. We start the afternoon with a little break. This lodge also had seen its best years quite some time ago. The Sukau River here is quite unusual. The rain forest which once was all around had to give way to the palm oil plantations. 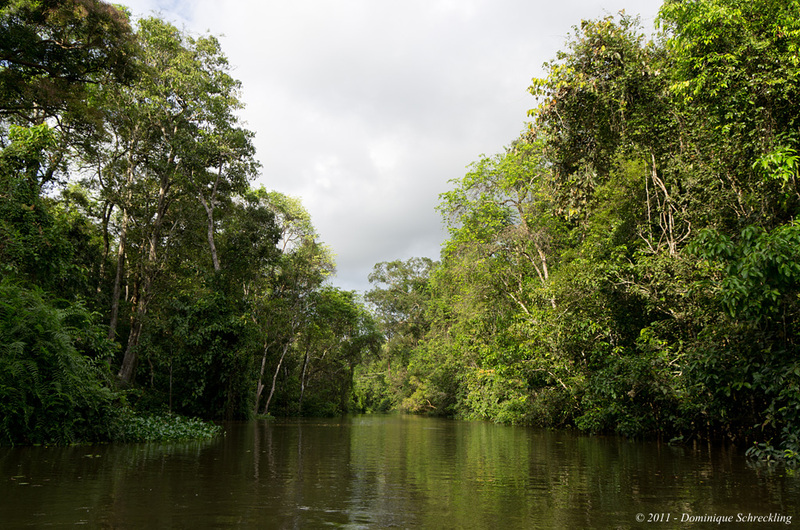 There is only a narrow strip on both sides of the river where the rain forest is allowed to grow. 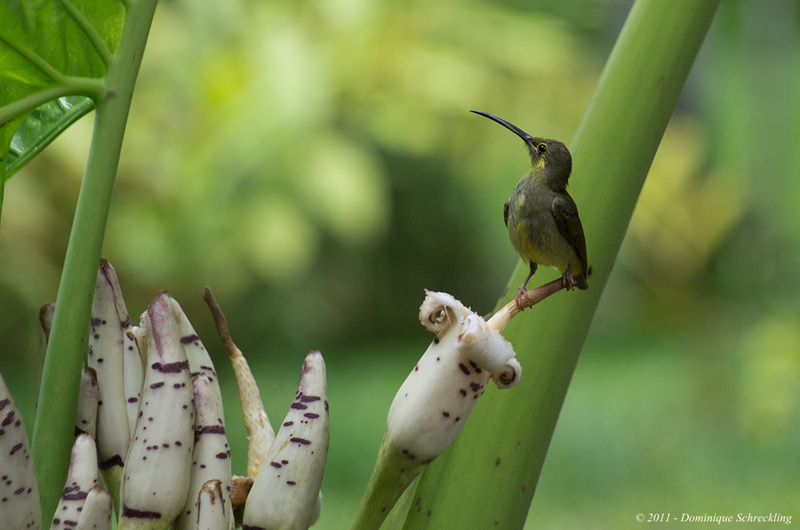 This green river border holds a tiny almost token nature reserve within the large plantations. Later in the afternoon we left the lodge for a river safari. We were shown two flying lizards by the jetty. From my experience in Africa, a river safari is the ideal place for bird watching as one can get really close to the birds when coming from the water. But this is Borneo; the birds fly away almost before being in site with the binoculars even when approached by boat. Dark clouds were approaching. Among the wildlife, we saw within photo reach macaques, a few Storked-Billed Kingfishers and a Black-and-Red Broadbill. There is also a group of proboscis monkey but they are out of reach. As it was getting darker and darker, we decided go back to the lodge. The rain caught us, however, before we arrived back. It was raining all night again. At breakfast our local guide explained the program for the morning. We would go by boat along the river and take a jungle trek to get a feeling for the jungle. Then he distributed leech socks! Once on site, we had to put these socks over our own socks inside the shoes and pull them up to the knees where we had to tie them. With all the rain of the past days, it might have been infested by leeches. We left the lodge at 8:00 am by boat. During the ride, we watched out for birds and saw kingfishers, herons and various birds of prey as well as a Storm’s Stork. After one hour, we started the hike into the jungle after having put on the leech socks. It was really difficult to walk inside that jungle. It was extremely dense, very humid and excessively muddy. The level of noise was most impressive; it is hard to imagine that a forest could be so loud. We had to give up the hike after a while because of the level of mud which made it too difficult. Thankfully, there were nearly no leeches around. Back at the lodge by 11:00 am, we had to clean our clothes and shoes from a tremendous amount of mud. After lunch I took a walk in the areas around the lodge. There were a lot of loud noises of breaking branches coming from nearby trees. The dense forest does not make it easy to see where the noise is coming from. A large dark silhouette is moving in the canopy above me. I first think about a group of proboscis monkeys until I took a look through a telephoto lens, the fingers are quite long and hairy: it is an orang utan in the wild! We left the lodge for another river safari by boat at 4pm just after a heavy downpour. This time we saw proboscis monkeys and hornbills. But the river safari did not last long this afternoon. A dark wall of rain was coming towards us and within a few minutes, we were being drenched. Just like all the other boats of the other lodges, we headed back to the lodge. Our boat fits very well with our rustic and poorly maintained lodge. Of all the boats it was our boat that featured the weakest engines by far and all other boats overtook us easily. By 6:00 pm we reached the lodge soaking wet. We tried to remember that this is actually supposed to be the dry season on Sabah. According to the local guide, we would normally not experience any rain during March and April, but this year is completely different. There was a downpour during most of the night. In the morning, the small bridge at the end of the lodge was under water, as was part of the land around the lodge. We started at 7:45 am in the morning on another boat ride. We saw a black snake with yellow rings, but extremely well hidden in the bush. There was also a group of parrots perched high up on a tall tree. 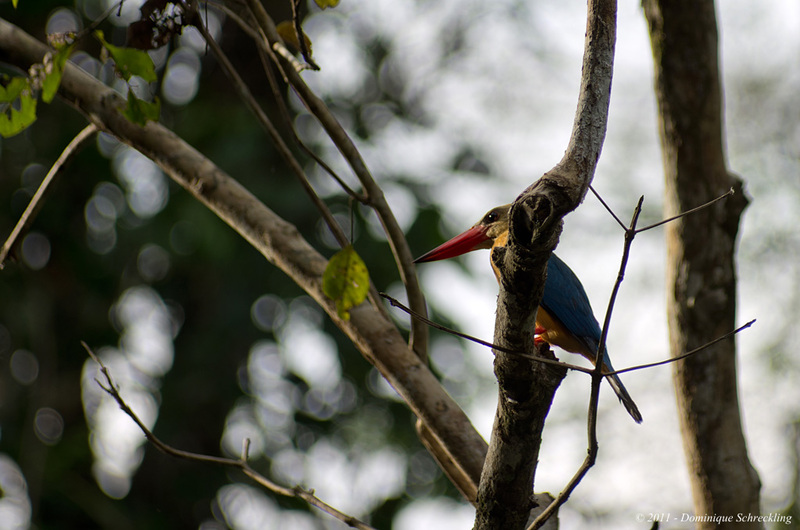 A Storked-Billed Kingfisher presented itself nicely ahead of us. A little while later a group of Probiscus Monkeys showed up. Shortly before returning to the lodge, a darter dried his feathers in the sun, with a leech on its head. By 11:00 am we were back from the boat ride at the lodge and quite remarkably without a single drop of rain! After lunch we went to visit the large Gomantong Caves, a large limestone outcrop. At the entrance of the caves an unexpected surprise awaited us; a group of Maroon Leaf Monkeys in the trees around the caves. The camera fee here is, however, too expensive so I enter the cave without a camera. The caves are huge. They are home for many animals, including large populations of cockroaches and bats. But the main use of the caves for the local human population are the swiftlets whose nests are harvested for the swallow’s nest soup. The paths in the cave are incredibly slippery. After visiting the cave we returned to the lodge. Besides interesting encounters with several monkeys, birds and other animals and the impressive walk in the jungle, I am shocked to how little is done to protect the nature on Borneo. I was not aware that the oil palm plantations have replaced such a large surface of rain forest. This narrow remaining border of the rain forest along the Sukau River shows a quite large biodiversity for such a tiny strip. How long can the work at the Sepilok Rehabilitation Center continue to return the orang utans to the wild when their natural habitat is replaced by oil palm plantations? There is still a lot to be done in regards to nature conservation on Borneo. We departed from the lodge at 7:30 am. It was overcast but the sun started to shine through. We drove to Lahad Datu. The cloud cover broke up soon and we enjoyed the sun. We reached Lahad Datu at 10:00 am. It’s nice and hot. We took a longer break to walk around the town of Lahad Datu before having a delicious meal in a Chinese restaurant. By 1:00 pm we left Lahad Datu. Instead of our usual tour bus, we were on board two Toyota 4wd vehicles to take us to the lodge. The roads will probably not be good. The first road out of Lahad Datu was still very good. 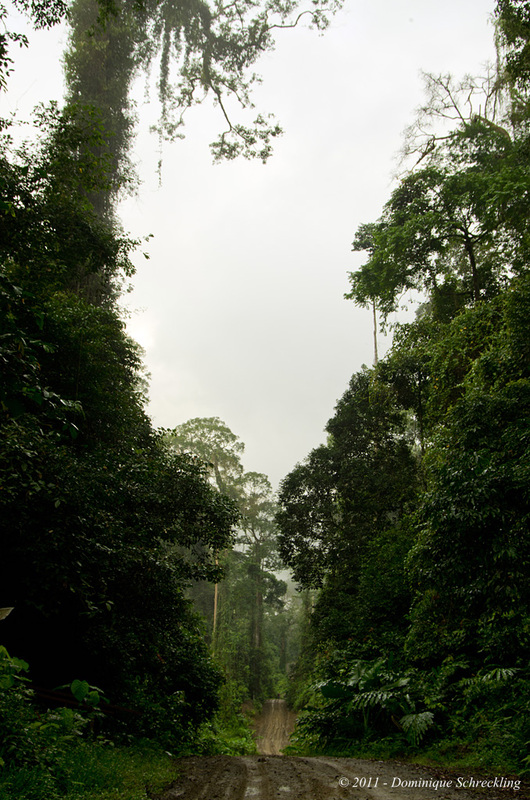 However, pretty soon, our driver left the main road to take the direction of the Danum Valley on a gravel road. 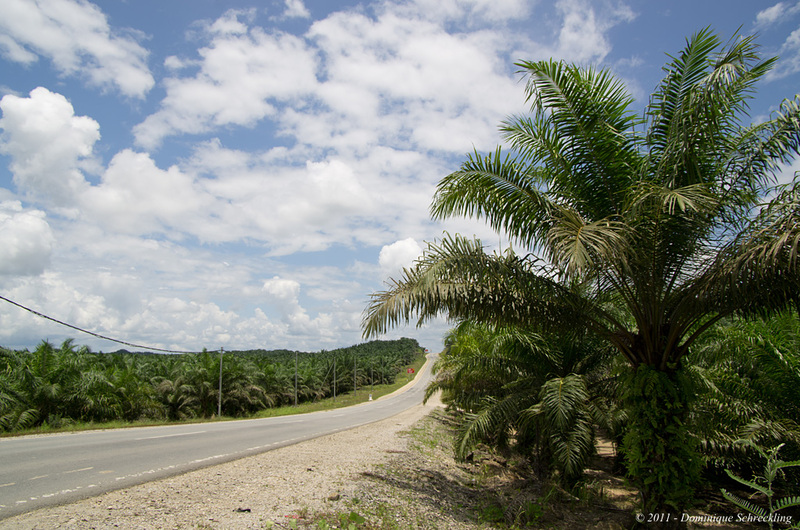 By leaving the main road, we also left the oil palm plantations for secondary rain forest. Considering the huge amount of rain over the past days, this gravel road was in surprisingly good condition. A few kilometers from the lodge, the forest on both sides of the road changed from secondary rain forest to primary rain forest. We reached the Borneo Rainforest Lodge a bit before 4pm where local guides of the lodge gave us a short overview about what one can take during the stay on this lodge. We take the rooms. It’s a completely different category than all the other lodges of this trip, a very welcome change to have a clean, welcoming and well maintained lodge. After dinner, we took our first night drive. 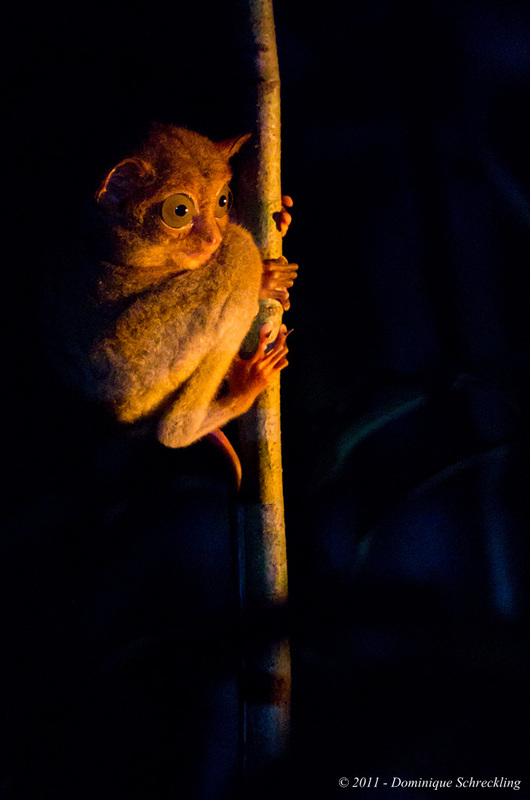 Before leaving however, a local guide of the lodge asked if we wanted to see a Western Tarsier. 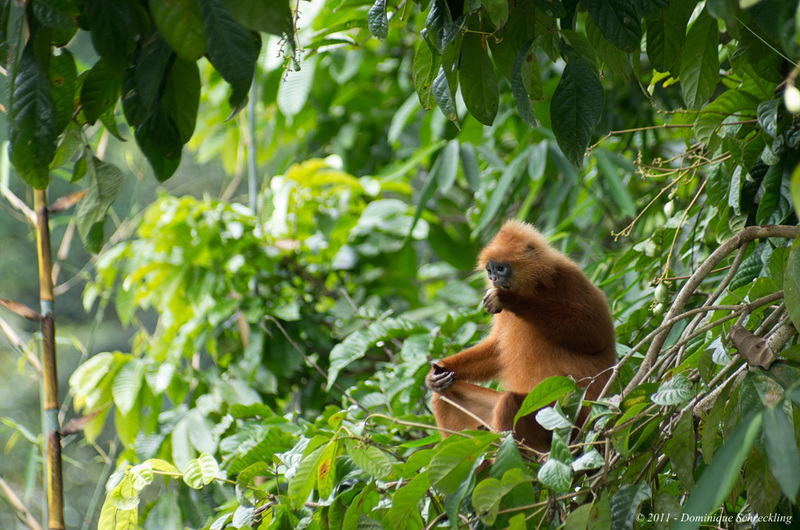 The small primate was located in wild ginger plants near the lodge. This encounter is pretty special. It belongs to these encounters you wish to have but know that the chances are very low. Then we took the night drive. A spotter took a seat besides the driver and searched in the surroundings for animals to show us. Night drives are here to show the nocturnal animals. As these are really difficult to see even for the trained eyes of the spotter, the night drives are an opportunity to experience the rain forest without our main sense: view. While we heard a lot of sounds and experienced the different smells of the forest, we did not see so many animals. There were several flying squirrels as well as a bee-eater sleeping on a thin branch. This day started early with an early morning hike even before breakfast. We were staying in an eco-lodge and the staff knows the guests are here to experience the real tropical rainforest. Shortly before 6:00 am, someone knocked at the door as gently as if sorry to wake me up. Outside a nice fog surrounded the rainforest to add even more to the mood of the rain forest. From the distance, one could hear Gibbons. 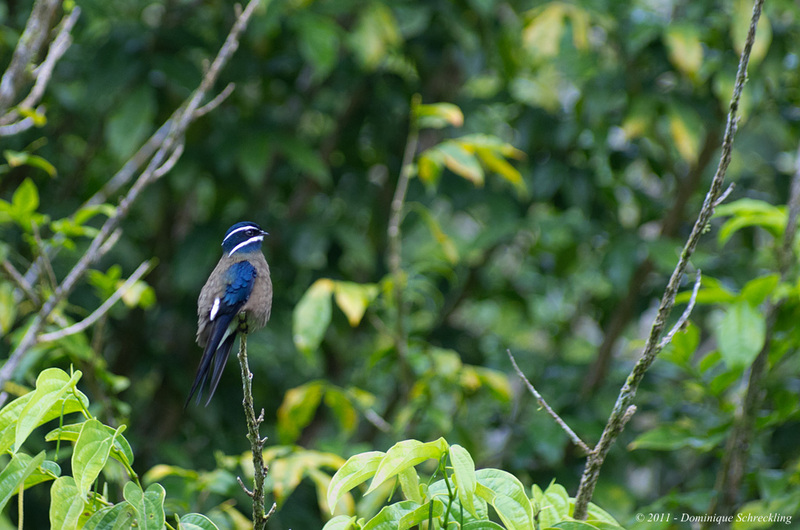 There are some Whiskered Treeswifts in the bushes around the lodge and surprisingly, their safety distance is much shorter than what we had experienced on the trip so far. At 6:30 am, we started the morning hike with the usual equipment, camera and most importantly: the leech socks. The lodge features a Canopy Trail and this was our program for the very first hike here. First we went along the road and needed to be careful about not losing our shoes in the deep mud of the road. The highest point of this Canopy Trail is 26m (85ft) above the ground. The path through the tree crowns is slightly wider and much more stable than the ones in the Kinabalu National Park. We could take our time and appreciate the view on the forest from above. There were not a lot of birds to be seen on this hike. We returnd to the lodge by 8:30 am where we first clean the shoes before having breakfast. The day program on this lodge was pretty intense. Soon after breakfast, we started at 9:30 am for the longer morning walk taking the Viewpoint-Trail. It goes over the river and up the hill to a lookout point from where one sees the Danum Valley, the river and the lodge. The temperature increased and the humidity also. The climb became more and more difficult given the conditions. On the way there were black squirrels as well as a few flowers. 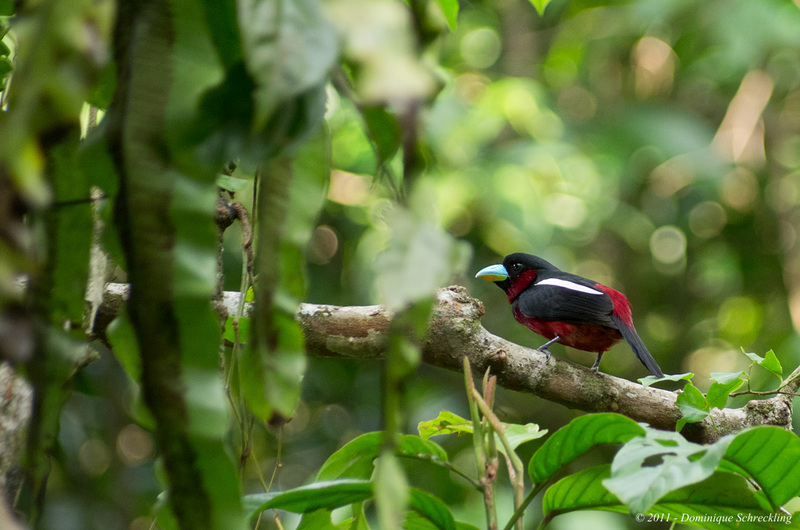 Again, birds were easily heard but extremely difficult to see in the primary rainforest. We reached the lookout, exhausted and sweaty. 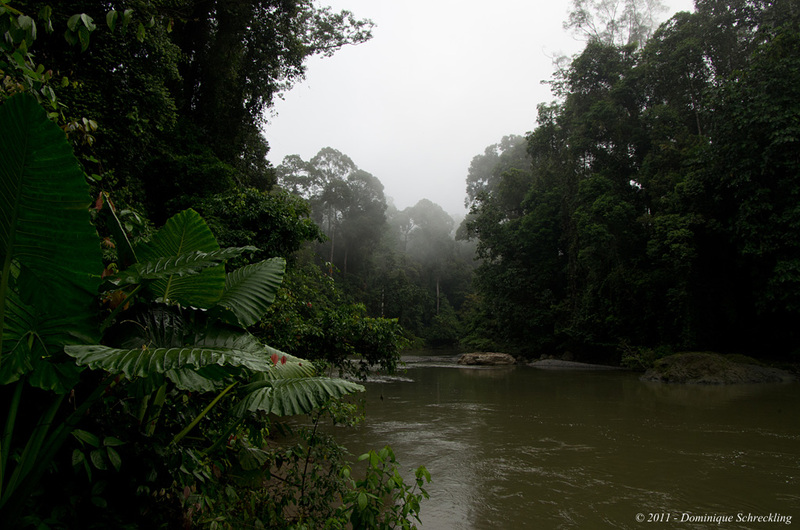 Fortunately, there were no oil palm plantations to be seen, only primary rainforest in the valley and the hills. We were back at the lodge by midday and had lunch, after having cleaned our shoes. During the break after lunch, I tried to approach Blue-Throated Bee Eaters. These birds build their nests in the meadows around the cottages of the lodge. At 3:30 in the afternoon we left for the afternoon hike. We took the Hornbill-Trail where an orang utan had been sighted the day before. However, we did not see much on this trail and went back to the road to take another look at the Canopy Trail. This time, we saw Maroon Leaf Monkeys and we also saw a bird for which birders from all over the world are coming to the Danum Valley to see this endemic species: Bornean Bristlehead. It remained, however, out of reach for a camera. By 6pm we were back in the lodge and cleaned our shoes once more. I have rarely cleaned shoes as often before. Back in the room, I discovered that despite the leech socks, I have three bites from leeches. I have now fulfilled the requirements to be admitted as member to the Blood Donor Society of the Danum Valley Conservation Area. After dinner, we took our last hike for the day, a night walk. Equipped with headlamps and of course leech socks, we head into the forest on the Hornbill-Trail. I have often been in tropical rainforests around the world, but this was the very first time I am taking a night walk in these forests. The sound level of the tropical rainforest is already surprisingly loud during the day; it seems even louder at night and as it was night, you see nothing. Is a loud sound from a fairly close animal? Is a low sound maybe from a too close tiny insect? Apart from a sleeping dragonfly, we were shown many insects such as strange looking millipedes, toxic centipedes as well as a quite large huntsman spider. Then we went back to the lodge where we cleaned our shoes for the last time that day. Such a day is pretty exhausting. The day program is fully packed with hikes into the tropical rainforest. It was also rewarding to be allowed to have such a close experience; one has no idea about the noise level in these forests. Quite a lot of animals were seen and there was a vast variety of plants. One could see several different kinds of ferns on just one single hike. There had been a welcome change in the weather as well, a whole day without any single drop of rain. It poured again during the night. We left for the early morning hike by 6:30 am and took the Danum-Trail which goes along the riverside. A quite dense fog fills the valley. Some Storkbilled-Kingfishers were actively fishing in the river. 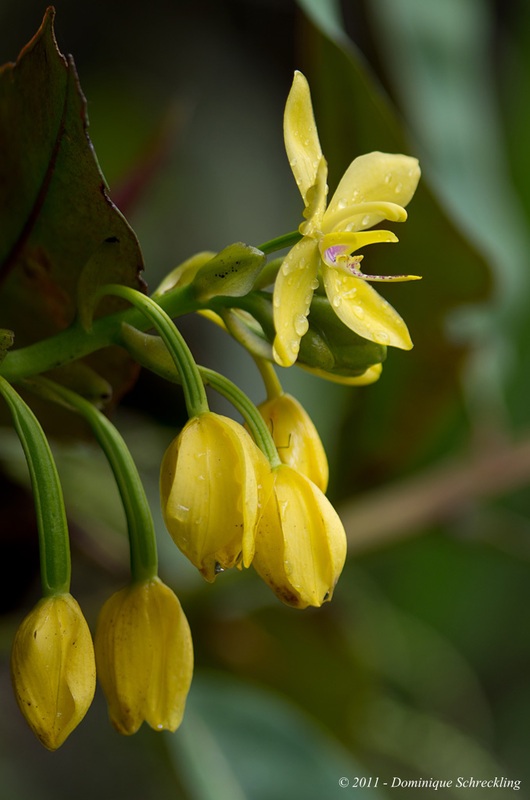 We are back in the lodge by 8am and while cleaning our shoes, a Lesser Yellow Eared Spiderhunter fed on some ginger flowers just in front of us. This lodge is in such a remote area that the birds can still be seen within normal distances. After breakfast at 9:30 am we took our next leech feeding hike. We take the Segama-Trail. The rain during the night brought not only a lot of mud but also a lot of leeches. There is no problem with leeches as long as you walk, but as soon as you stop, you can observe them on the ground as they are approaching. The leeches make bird watching even more difficult. The leech socks are effective in that they do prevent the leeches from having contact to the skin as soon as they are on you. But the leeches try to climb on the socks and trousers until they reach skin. We have to stop from time to time to examine our trousers. 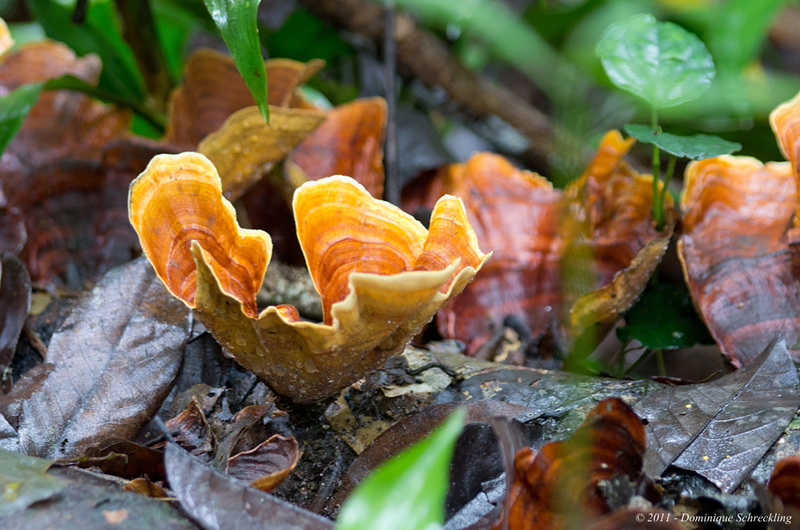 Apart from the leeches, we saw many different fungi as well as small orchids. We also discovered a Great Slaty Woodpecker, the largest woodpecker on Borneo. We arrived at the lodge at midday at the very same time as a new group of tourists. We must have given a great first impression to this new group. Imagine arriving at a beautiful lodge and seeing a group of tourists coming out of the rainforest, covered with mud, sweaty and each of us with at least one patch of blood somewhere on the clothes, either back, shoulder, arms or legs. During lunch, there were a few Maroon Leaf Monkey in the trees just in front of the lodge. After lunch, I gqve another try to take photos of the bee-eaters. Pretty soon, I found one sitting on a pole with a large dragonfly in its beak just in front of me. By 3:30 am in the afternoon, we started the hike on this hot sunny afternoon. Half of the group is exhausted from the morning hikes or perhaps just not willing to have any more encounters with leeches and stayed in the lodge. We take the Belian-Trail. We entered the rainforest. The local guide of the lodge wanted to show us the pitas, the birds feeding on leeches. This guide imitates the call of the birds and pretty soon he was able to locate two of them. We tried to approach while the guide called them. The birds repled to the calls but did not get closer. We hid behind a bush and prepared the cameras while the local guide continues to attract them. It was not even 4pm but it is suddenly getting darker. Rolling thunder is to be heard from a distance. The pitas came closer and closer, but the thunderstorm got closer as well. The local guide finally decided that it is too risky to stay in the forest, the thunderstorm being nearly on us, we headed back to the lodge as fast as we could. We did not make it on time. It was pouring down and within just a few seconds, we are all soaking wet. We were asked if we wanted to take a night hike. We all preferred to enjoy the relaxing lodge for our last night in Malaysia. The days were quite exhausting with the four hikes per day this lodge offers, but it is what the guests are there for. The lodge offers a vast network of trails within the rainforest and has very well trained local guides. Entering the rainforest at different times of day and night gives a full overview of the rainforest. I appreciated this part really a lot with the Maroon Leaf Monkey just outside the main building of the lodge, the birds which could be observed within normal distances, the nocturnal insects and of course the cute little Western Tarsier. The experience of this rainforest remains unforgettable. After breakfast, we left the beautiful lodge at 9:30 in the morning. Suddenly, the driver stopped the car. There was a huge surprise in the middle of the road ahead of us: an elephant! We were just able to take our last photos of the trip before the elephant disappeared with ease into the dense rain forest. By midday we arrived at the airport in Lahad Datu where we started our very long journey home over Kota Kinabalu, Kuala Lumpur and Frankfurt. On the downside, countries in Southern Africa do protect the environment much better than Malaysia on Sabah. I have the feeling National Parks have been created to attract tourists without changing the habits. People can still hunt and fish inside. The large safety distance of the birds showed a disturbed environment. I knew about the problems of deforestation on Borneo, but I did not expect it to be on such a level. Seeing oil palms along the roads while driving for hours is definitely not enjoyable. 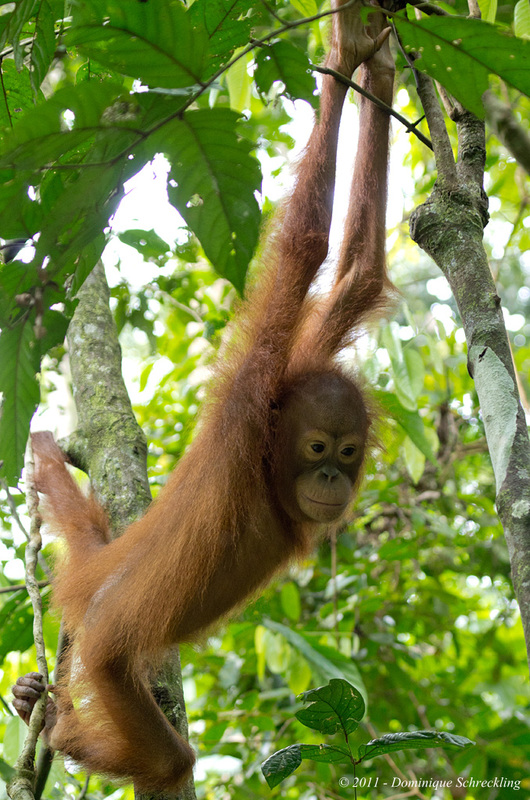 The Sepilok Rehabilitation Center expects that within 10-15 years, orang utans will have disappeared from the wild. It takes 200 years for a secondary rainforest to build up and 2000 years to turn it into a primary rainforest like the Danum Valley. The weather could of course also have been better. On the upside was, of course, the experience of the rainforest; be it the rainforest on Mount Kinabalu, the narrow jungle on Sukau River or the vast primary rainforest in the Danum Valley. The intense sound level inside these forests shows the biodiversity these forests do host. We had the chance to see many animals, sea turtles coming to the beach to lay eggs, orang utans, maroon leaf monkeys, western tarsier, a vast variety of birds, many insects and the surprise of an elephant in the wild. All in all, this trip gave me a lot of unforgettable memories. Should one want to see these treasures of nature and experience the many aspects of the rainforests of Sabah on Borneo: do it quickly before it disappears.